Think quick: what’s the first thing that comes to mind when someone brings up the topic of land speed records? For us, it’s sports cars with slick aerodynamic setups, powerful powertrains, and feather-like weight. 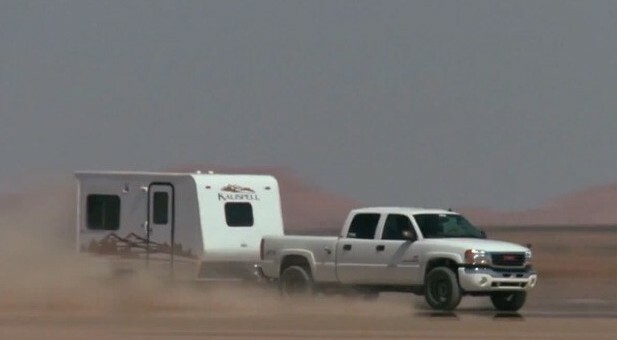 A truck pulling a trailer as fast as humanly possible doesn’t come to mind… at all — unless you’re talking to the folks at Diesel Power — who recently set the record for the fastest vehicle towing a trailer. To do so, the pulling car and its freight needed to travel faster than 139.11 mph — the velocity set by the previous record holder, who reportedly did so with a tuned Mercedes sedan (yup, sedan!) towing a Caravan/Travel Trailer… in South Africa. The DP crew took a first-gen GMC Sierra 2500 HD and packed it with over 1,000 horsepower and a two-stage nitrous set up. The trailer itself was also given some upgrades, dumping the standard wheel and tire combination for a pair of V-rated radials. That’s such a tiny trailer. Why not try it with a 53 foot trailer loaded to 60,000 pounds. They should have put a Hennesey 1426 HP V8 gasser in there and saved the Nitrous for a Halloween party. They did what they did, used what they used, and it was fun, and fun to watch.